Leading companies to name in a largely consolidated global mobile mapping market are Google Inc., Microsoft Corporation, Mitsubishi Electric Corporation, Telefonaktiebolaget LM Ericsson, Qualcomm Inc., Apple Inc., Tomtom NV, Garmin International, OSI Geospatial Inc., and Leica Geosystems Inc. 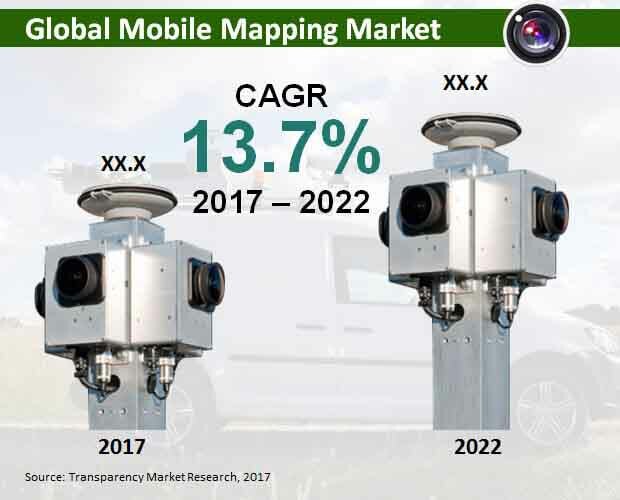 According to a commerce and business intelligence study by Transparency Market Research (TMR), the global mobile mapping market is predicted to display a strong 13.7% CAGR over the forecast period between 2017 and 2022. At this pace, the market’s valuation of US$12.9 bn in 2017 will become US$24.4 bn by 2022 end. Based on solution, location based services segment is predicted to dominate through 2022, rising at a CAGR of 16.2% therein. In absolute value, the segment is predicted to be worth US$10.1 bn by the end of 2022. With mobile mapping applications increasingly becoming common in smart electronics, the location based services segment is poised to remain dominant contributor to the overall market. The location based services segment held 37.2% of the global mobile mapping market in 2017. By geography, North America is predicted to continue to remain dominant region for mobile mapping. Extensive use of advanced smartphones and surge in development of mobile mapping technology based apps are key to the growth of North America mobile mapping market. The mobile mapping market is rising at an impressive pace due to several factors, says the author of the report. Over the past twenty years, the demand for geo-spatial data has surged exponentially which is a key factor behind the growth of mobile mapping market. While geo-spatial data can be obtained via several sources, data which is more accurate, has higher density, is rapidly produced, and acquired in a less expensive manner is most sought after. Mobile mapping systems integrate various remote sensing technologies with navigation that allows mapping from moving objects (e.g., airplanes, cars, boats, etc.). This serves to obtain the 3D coordinates of the points of interest. Rapid advancement of satellite mapping technology and its easy integration into smartphone design is boosting the mobile mapping market. As smartphones become ubiquitous and sophisticated, mobile phone manufacturers are increasingly equipping them with global positioning system (GPS) capabilities. Today, most smartphones are considered the most widespread platform equipped with low-cost GPS receiver and motion sensors, which provides the location of the user within few meters of accuracy. This makes for one of the most important feature of smartphones. Furthermore, growing interest of large mobile application developers to develop user-friendly mobile mapping applications is likely to boost the growth of mobile mapping market over the coming years. However, on the downside, use of smartphones for mobile applications pose challenge of accuracy due to sensors’ errors.